Welcome to the answers of todays puzzle for Mystic Words. Mystic Words provides free daily puzzles. 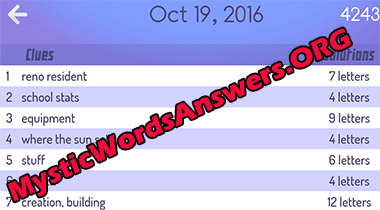 These are the answers for todays puzzle October 19, 2016. If you need the answers to any other date, just browse the list on this page: Mystic words daily. Select the date and then all the puzzles for that date will be displayed.